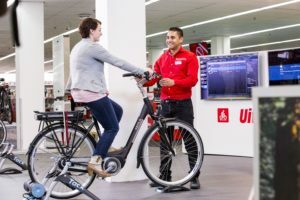 AMSTERDAM, the Netherlands – In addition to the e-MTB drive units E8000 and E7000 as well as the E6100 city/trekking e-bike groupset, Shimano now introduces the E5000 for city/comfort bikes. With these four systems Shimano offers a complete range in the main e-bike categories. But how is the performance in real-life? Bike Europe took the opportunity to test the E6100 system in down-town Amsterdam. The E6100 e-bike drive unit guarantees a smooth riding over Amsterdam’s short but steep canal bridges. This redesigned mid-motor comes with new 418Wh or the 504Wh batteries. The E6100 mid-motor weighs only 2.8 kilograms, a reduction of 210 grams from the previous E-6000 version. Two versions of the drive unit are available, one in a trekking style and the other in city style with a fully-enclosed chain guard. Both come with a range of crank options including 170mm crank arms for extra ground clearance and a choice of either 38T or 44T chainrings, offering compatibility with Gates belt drives. 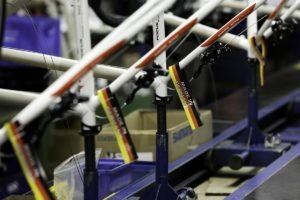 Other drivetrain options include the choice of internal hub gears, or an external derailleur and cassette, both with the choice of Di2 electronic shifting or mechanical shifting components. Especially the set up with the smooth operating Di2 electronic shifting makes the Amsterdam city ride with its traffic lights, steep canal bridges and busy bicycle traffic lanes very convenient. 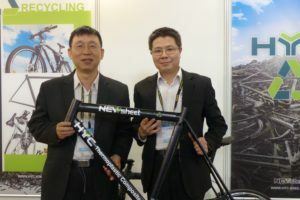 The E6100 is the first system that comes with the new NEXUS Inter-5E internal hub gear dedicated for e-bikes. Shimano STEPS was previously available with Alfine Inter-11/8 speed or NEXUS Inter-8/7 speed internal hub gears (IHG) or an external derailleur and cassette. The new NEXUS Inter-5E with its capacity to handle 60Nm. 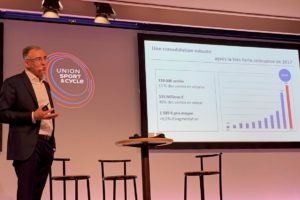 The e-bike specific gears offer a total ratio of 263% which proved to be very useful in Amsterdam’s traffic as well as to handling the cities’ steep canal bridges. 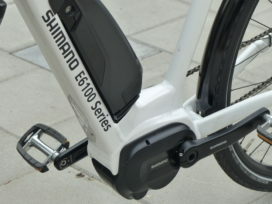 The latest addition to Shimano’s e-bike drive unit range is the E5000. 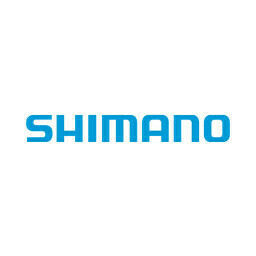 According to Shimano it isn’t designed to provide rapid acceleration and/or off-road handling of the e-MTB series, but it is targeted to entry level e-bikes. With its light-weight comfort components and power assistance it’s designed to give riders a helping hand in city traffic. Generating an efficient 40Nm of torque, the drive unit weighs only 2.5 kilograms combined with either a rear derailleur or internal hub. The combination of the small sized motor, an internal hub and the internal battery can create a disguised looking urban e-bike. The display unit allows for the use of third party cycling computers or a smart phone in conjunction with the new EW-EN100 junction box and a new E-TUBE RIDE phone app which can display riding information. 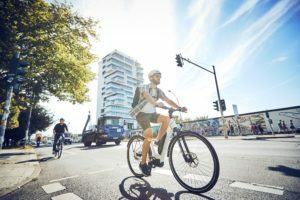 For a truly simple set-up riders can just use the EW-EN100 junction, removing the high-value computer and support switch, making the bike’s components less susceptible to theft. The Shimano STEPS E5000 drive unit and dedicated FC-E5000 crank arm set will be available from late-November 2018 onwards.